Oh, those dreary, drizzly days of autumn, mist and rain making puddles, soaking golden leaves, keeping you indoors when all you want is to go outside and play. But a good rain shell can change that. Indeed, with the right jacket wet weather does not need to slow you down. What this refers to is a proprietary Mountain Hardwear nylon called Incite that’s about as thin and light as bug netting — purportedly weighing just 1.7 ounces per square yard — though coated with a sweat-wicking waterproof membrane. The resulting jacket, which comes in men’s and women’s builds, weighs scant ounces though does the same basic job of keeping raindrops out as well as a rubbery yellow slicker. Make that a better job, as the Quark has some stretch and breathes when you sweat, letting you hike or pedal a mountain bike regulated and unencumbered by the clothing keeping you dry. On my scale, the men’s Quark in size large weighs 9.3 ounces, which is half the weight of some competing rain coats. It packs and rolls to the size of a large bean burrito for easy storage in a backpack or bike bag. 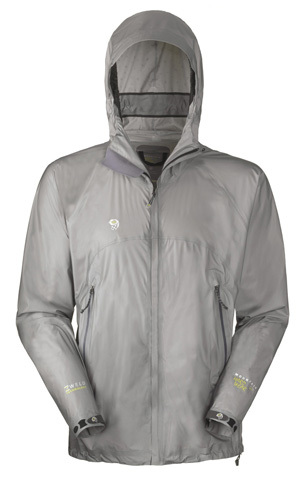 All these magic features do not come cheap, as the Quark goes for $200 on www.mountainhardwear.com. It sells for less than $150 on some online retailers. This steep price includes the aforementioned waterproofness plus a fabric that wicks sweat during moderate exercise. Do a hard run in the Quark — or any waterproof jacket, for that matter — and droplets of moisture inside the fabric are almost guaranteed. No breathable shell I’ve ever used can compete with my sweat generation on an intense run. But for moderate activity, the Quark feels airy and breathable. It has pit zips to add ventilation if needed. The hood is large enough to fit over most helmets. Cinched up, it can fit tight and move with your head as you look left or right. A wide brim shields raindrops from the eyes. Another cool feature is this coat’s welded seams. The sleeves, hood, pockets and other components are not stitched with needle and thread but welded on fabric-to-fabric, saving weight and making the shell easier to keep watertight. I bring a light shell like the Quark with me at most times in the outdoors as emergency protection against foul weather. It sits in my pack on long hikes or mountain climbs, rarely used during most adventures, though always there and ready should the clouds swell up and turn gray in a sad attempt to wreck my day. Update: A week after writing this column, the Quark jacket had a critical product failure when the zipper broke during a climb on Kings Peak. in Utah. Indeed, with no snaps or Velcro, I was unable to secure the shell shut, leaving me vulnerable if the weather had turned bad. Though I think I was to blame for the breakage — I yanked on the zipper at home when it snagged, unwittingly cracking a bottom tooth — the scenario has reinforced a realization with me about durability disadvantages in ultra-light gear.